At almost 2,000 acres, the Phoenix Park is one of the worlds largest city parks. Established in the 17th Century, the park has maintained its atmosphere of rural tranquility despite being in the very heart of the city, and contains a whole host of attractions. From the city centre it is a short direct route to the Parks main entrance. Although this is only a short distance, care should be taken as there are no dedicated cycle lanes and it is an area that suffered from heavy traffic congestion. Once the park is reached however, a cyclist of any experience level will find an extremely safe environment with a great number of cycle lanes entirely separated from traffic. This is an environment for children to cycle in safety. 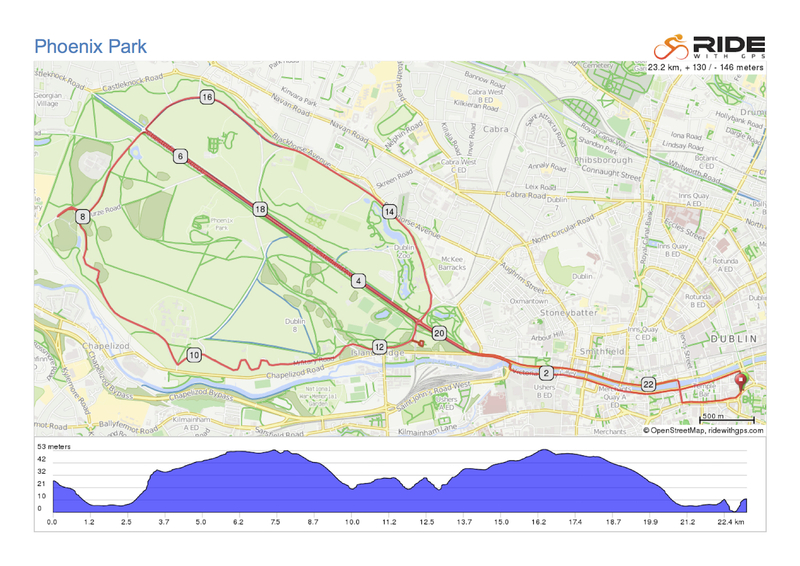 The park is neatly bisected by Chesterfield ave, and travelling along it allows for fantastic panorama views of the whole park and even beyond to the Dublin mountains. Along this route a number of interesting landmarks may be view. Aras an Uchtarain, the historic home of the Irish President is passed, and just beyond is the American Ambassadors residence. To the south you should catch a view of the Papal Cross, where an estimated 1.2 million people gathered in 1979 to see Pope John Paul perform mass. Phoenix Monument that follows the parks outer walls near Chapelizod. This is one of the more secluded parts of the park and contains some splendid scenery, and is often a good point to spot some of the hundreds of wild deer that inhabit the park. Looping back along the Military road, the remains of the Magazine Fort which dates from the 17th century is passed. This is a long abandoned soldiers barracks and munitions storage. 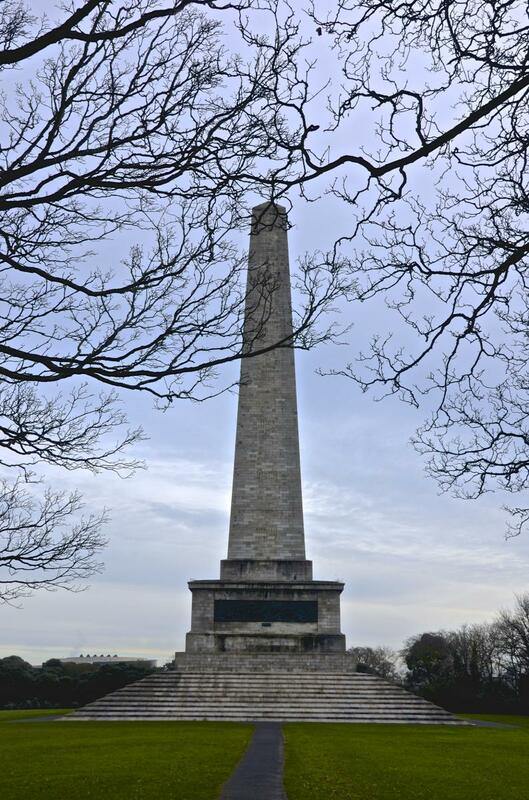 Before returning to Chesterfield Ave, the Wellington Monument is passed on the right hand side and is well worth a brief detour. Crossing Chesterfield ave once more, the route passes both the beautiful Victorian Garden and Dublin zoo, before arching back onto the far end of the avenue and the last long straight stretch across the park and back to the city centre. An alternative route to cycling the busy city quayside to the park is to follow the Luas, or tramlines through Smithfield. Although cycling this cobbled route is officially frowned upon, it is popular with cyclists and comparatively much safer for someone unused to cycling in heavy traffic. Visit the zoo. Dublin Zoo is one of the oldest and best in Europe and is a delight for children. Visitor Centre and Ashtown Castle. Free admission to a multimedia guide to the parks history and wildlife. See www.phoenixpark.ie/visitorcentre. Wellingtons Monument. Europe’s tallest obelisk and still one of Dublin’s highest features is a visible landmark throughout the park and its environs. Erected 1861 by the British as a memorial to Arthur Wellesley, Duke of Wellington, the monument features four bronze relief plaques cast from cannons captured from Napoleon’s defeated armies at the Battle of Waterloo. Victorian Walled Garden. Just inside the main gate is a popular place to relax and enjoy the (occasionally) good weather. Wellingtons Monument. Europe's tallest obelisk. 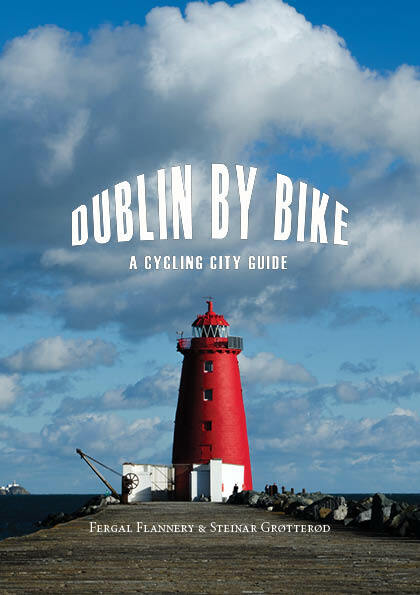 The park is very popular with Dubliners to run and cycle in, particularly in the evenings after work.